Dressage is one of the most challenging riding sports, and demands a high level of skill from both rider and horse. Dressage is considered by many to be the pinnacle of horse training, and requires both the horse and rider to perform a complex and gymnastic arena routine of specific movements. Both rider clothing, and horse tack, are regulated for competition dressage. 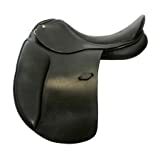 Dressage saddles are English-style saddles, and provide a deep, padded seat, thigh blocks and extended stirrup bars. Finding a good fitting dressage saddle for you and your horse can be incredibly difficult. However, if you take your time and talk to the experts, it is well worth your time. The best option is if you can find a true saddle fitter and have them match you with the right make and model for the both of you. If this option is not available, it is a good idea to try a variety of saddle via borrowing or on a trial basis. A properly fit dressage saddle allows the rider to maintain good contact with the horse throughout the seat and legs, and to feel the gait transitions. A well fitted dressage saddle puts the rider in a position that is in balance with his horse. 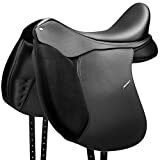 The saddle seat should be the right length for the rider's body, and its design should place the rider in the correct dressage position. This enables the rider to apply aids quietly and effectively without excessive movement in the saddle. The deep seat provides and bit more security than hunt or all purpose saddles. Dressage saddles have longer billets, and shorter girths than general purpose English saddles. Dressage saddles also have longer flaps and stirrups - which allows the rider to hold the horse better in case of shying or sudden veering. A properly fit dressage saddle allows the horse to move freely as it isn't tight around his shoulders. The pommel (front part) clears his withers, the gullet (central underpart) doesn't press on his spine, and the padded areas spread the rider's weight evenly over his back, without rocking back and forth or from side to side. The horse can move in balance underneath the rider. A properly fit dressage saddle helps the horse 'hear' his rider's aids better, and the rider will be able to use lighter and lighter aids, resulting in a more willing horse and more satisfied rider. 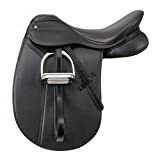 Dressage saddles are designed for use in dressage, and are not versatile saddles which can be used for other disciplines as they make the rider sit in the classical dressage position. Dressage saddles also require separate girths, as the girth straps are much longer than that of a general purpose English saddle. Dressage saddles tend to be rather costly. If your serious about improving your dressage riding, get a dressage saddle!! !